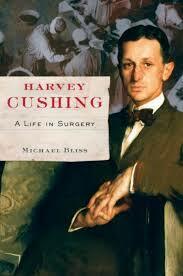 Dr. Cushing was born in Cleveland Ohio. The fourth generation in his family to become a physician, he showed great promise at Harvard Medical School and in his residency at Johns Hopkins Hospital (1896 to 1900), where he learned cerebral surgery under William S. Halsted. After studying a year in Europe, he introduced the blood pressure sphygmomanometer to the U.S.A. He began a surgical practice in Baltimore while teaching at Johns Hopkins Hospital (1901 to 1911), and gained a national reputation for operations such as the removal of brain tumors. From 1912 until 1932 he was a professor of surgery at Harvard Medical School and surgeon in chief at Peter Bent Brigham Hospital in Boston, with time off during World War I to perform surgery for the U.S. forces in France; out of this experience came his major paper on wartime brain injuries (1918). In addition to his pioneering work in performing and teaching brain surgery, he was the reigning expert on the pituitary gland since his 1912 publication on the subject; later he discovered the condition of the pituitary now known as “Cushing’s disease“. Today, April 8th, is Cushing’s Awareness Day. Please wear your Cushing’s ribbons, t-shirts, awareness bracelets or Cushing’s colors (blue and yellow) and hand out Robin’s wonderful Awareness Cards to get a discussion going with anyone who will listen. And don’t just raise awareness on April 8. Any day is a good day to raise awareness. I found this biography fascinating! I found Dr. Cushing’s life to be most interesting. I had previously known of him mainly because his name is associated with a disease I had – Cushing’s. This book doesn’t talk nearly enough about how he came to discover the causes of Cushing’s disease, but I found it to be a valuable resource, anyway. I was so surprised to learn of all the “firsts” Dr. Cushing brought to medicine and the improvements that came about because of him. Dr. Cushing introduced the blood pressure sphygmomanometer to America, and was a pioneer in the use of X-rays. He even won a Pulitzer Prize. Not for medicine, but for writing the biography of another Doctor (Sir William Osler). Before his day, nearly all brain tumor patients died. He was able to get the number down to only 5%, unheard of in the early 1900s. This is a very good book to read if you want to learn more about this most interesting, influential and innovative brain surgeon. (BPT) – More than 80 years ago renowned neurosurgeon, Dr. Harvey Cushing, discovered a tumor on the pituitary gland as the cause of a serious, hormone disorder that leads to dramatic physical changes in the body in addition to life-threatening health concerns. The discovery was so profound it came to be known as Cushing’s disease. While much has been learned about Cushing’s disease since the 1930s, awareness of this rare pituitary condition is still low and people often struggle for years before finding the right diagnosis. In addition to routine blood work and urine testing, health care professionals are now also able to test for biochemical markers – molecules that are found in certain parts of the body including blood and urine and can help to identify the presence of a disease or condition.